New Summer Classes Have just been posted. Please go to: "CLASSES" on menu bar to see what's going on!! UPS does not want to recognize that address from time to time, However, it IS our address and does work!!!! sales on the internet as opposed to brick & mortar. Bear with us as Pauline ties to update this web site to be accurate with our transitioning out of the showroom aspect. Thank you all for your support over the years! We will be growing our online store on this site to carry the many unusual and specialized tools we have been known for &/or developed. PAULINE'S MATTING AND CHASING TOOLS ARE OF PARTICULAR FOCUS. Soon, they will be featured here. Classes will be continued in full force. Rachel, Pauline and Mig will be teaching on a regular basis year round. Supplies will be available on site as needed for each class. Also on special order. Our classroom is now in the space that is currently our classroom #8 Oak Hill Plaza, Scarborough, Maine. The entrance is on the side of the building, facing the backside of ACE hardware. We will post class schedules on this site regularly. 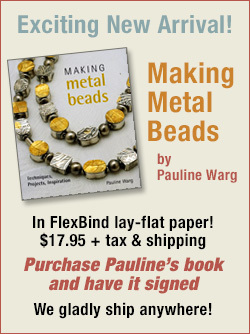 Pauline will be working hard on her new line of fARTlekjewelry® in her home studio. Our office will also be in our home. We will be in the studio @ Oak Hill during classes, by appointment or by chance. Further development of the "STORE" is in progress. We will focus on unusual and hard to find tools, at at long last Pauline's chasing and matting tools! Please check in regularly. and get it signed by the author! There is no better way to add color to your jewelry than enameling - and anyone can do it! Join master jeweler Pauline Warg in Jeweler's Enameling Workshop, where she shares her easy-to-follow approach to enameling. From the basics of safety and equipment needed to torch-firing on metal and creating stunning cloisonné through kiln firing - plus everything in between, Pauline has it covered in this comprehensive guide. This thorough guide to all the basics on how to create colorfully rich decorative enamel work on metal is a must have. From safety to the basic concepts of working with powdered glass to a wide variety of decorative techniques, this DVD has it all. The fARTlek Jewelry® line has been developing a more and more expansive line. -We carry a number of unusual and specialized tools for jewelers and metalsmiths. They are available on this site under "STORE"
-Our teaching studio accommodates up to 6 students in a bright, clean, well-equipped space. We offer a variety of classes for the novice or professional. -Classes are taught here @ #8 Oak hill Plaza, Scarborough, Maine 04074, and listed on this site. There is a map on this site under "CONTACT". We are thrilled to announce the addition of e-commerce to our website through our online store. This is a very exciting way for us to grow and serve you better. CHECK OUT THE VIDEO of Pauline presenting a workshop in Arizona.